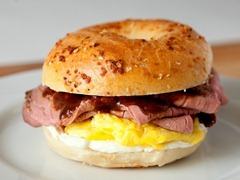 Are your breakfast sandwiches what your customers want? We can help. 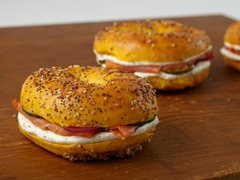 25% of Canadians are purchasing breakfast sandwiches least once a week, and another one-third purchasing one every two to four weeks. 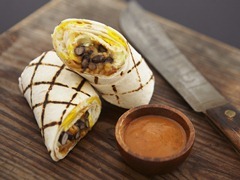 * Bolstering those statistics, and providing opportunity outside of typical breakfast hours, is a cultural shift in dining habits. 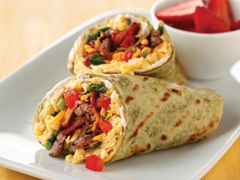 As more Canadians look for dining options outside of traditional mealtime hours, portable, handheld and all-day breakfast items gain favour. 52% of Canadian consumers say they are more likely to go to a restaurant with healthier options—even if they don't order a healthy option. 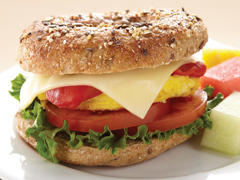 "Add a mix of wholesome choices to custom builds—whole-wheat bread carriers, egg whites, turkey bacon, grilled chicken and lots of vegetable choices," says Barry Miles, senior corporate chef, Kraft Foodservice. 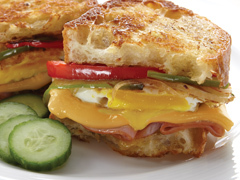 The chefs at Kraft Foodservice offer these handheld, flavour-forward breakfast sandwiches for your operation. 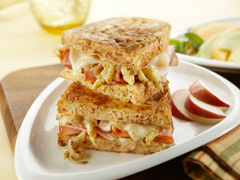 1* Source: Sandwich Consumer Trend Report (Canada), 2012, by Technomic.